The stock (also capital stock) of a corporation constitutes the equity stock of its owners. It represents the residual assets of the company that would be due to stockholders after discharge of all senior claims such as secured and unsecured debt. Stockholders' equity cannot be withdrawn from the company in a way that is intended to be detrimental to the company's creditors. Shares represent a fraction of ownership in a business. A business may declare different types (or classes) of shares, each having distinctive ownership rules, privileges, or share values. Ownership of shares may be documented by issuance of a stock certificate. A stock certificate is a legal document that specifies the amount of shares owned by the shareholder, and other specifics of the shares, such as the par value, if any, or the class of the shares. Stock typically takes the form of shares of either common stock or preferred stock. As a unit of ownership, common stock typically carries voting rights that can be exercised in corporate decisions. Preferred stock differs from common stock in that it typically does not carry voting rights but is legally entitled to receive a certain level of dividend payments before any dividends can be issued to other shareholders. Convertible preferred stock is preferred stock that includes an option for the holder to convert the preferred shares into a fixed number of common shares, usually any time after a predetermined date. Shares of such stock are called "convertible preferred shares" (or "convertible preference shares" in the UK). "Rule 144 Stock" is an American term given to shares of stock subject SEC Rule 144: Selling Restricted and Control Securities. Under Rule 144, restricted and controlled securities are acquired in unregistered form. Investors either purchase or take ownership of these securities through private sales (or other means such as via ESOPs or in exchange for seed money) from the issuing company (as in the case with Restricted Securities) or from an affiliate of the issuer (as in the case with Control Securities). Investors wishing to sell these securities are subject to different rules than those selling traditional common or preferred stock. These individuals will only be allowed to liquidate their securities after meeting the specific conditions set forth by SEC Rule 144. During the Roman Republic, the state contracted (leased) out many of its services to private companies. These government contractors were called publicani, or societas publicanorum as individual company. These companies were similar to modern corporations, or joint-stock companies more specifically, in a couple of aspects. They issued shares called partes (for large cooperatives) and particulae which were small shares that acted like today's over-the-counter shares. Polybius mentions that “almost every citizen” participated in the government leases. There is also an evidence that the price of stocks fluctuated. The Roman orator Cicero speaks of partes illo tempore carissimae, which means “shares that had a very high price at that time." This implies a fluctuation of price and stock market behavior in Rome. Around 1250 in France at Toulouse, 96 shares of the Société des Moulins du Bazacle, or Bazacle Milling Company were traded at a value that depended on the profitability of the mills the society owned. As early as 1288, the Swedish mining and forestry products company Stora has documented a stock transfer, in which the Bishop of Västerås acquired a 12.5% interest in the mine (or more specifically, the mountain in which the copper resource was available, Great Copper Mountain) in exchange for an estate. Economic historians find the Dutch stock market of the 17th century particularly interesting: there is clear documentation of the use of stock futures, stock options, short selling, the use of credit to purchase shares, a speculative bubble that crashed in 1695, and a change in fashion that unfolded and reverted in time with the market (in this case it was headdresses instead of hemlines). Edward Stringham also noted that the uses of practices such as short selling continued to occur during this time despite the government passing laws against it. This is unusual because it shows individual parties fulfilling contracts that were not legally enforceable and where the parties involved could incur a loss. Stringham argues that this shows that contracts can be created and enforced without state sanction or, in this case, in spite of laws to the contrary. A shareholder (or stockholder) is an individual or company (including a corporation) that legally owns one or more shares of stock in a joint stock company. Both private and public traded companies have shareholders. Companies listed at the stock market are sometimes expected to strive to enhance shareholder value. Of course, that does not explain how people decide the maximum price at which they are willing to buy or the minimum at which they are willing to sell. In professional investment circles the efficient market hypothesis (EMH) continues to be popular, although this theory is widely discredited in academic and professional circles. Briefly, EMH says that investing is overall (weighted by the standard deviation) rational; that the price of a stock at any given moment represents a rational evaluation of the known information that might bear on the future value of the company; and that share prices of equities are priced efficiently, which is to say that they represent accurately the expected value of the stock, as best it can be known at a given moment. In other words, prices are the result of discounting expected future cash flows. ↑ "stock Definition". Investopedia. Retrieved 25 February 2012. ↑ "Cambridge Advanced Learner's Dictionary". Dictionary.cambridge.org. Retrieved 2010-02-12. ↑ "Common Stock vs. 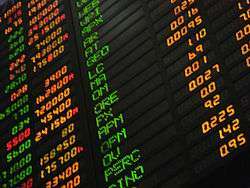 Preferred Stock, and Stock Classes". InvestorGuide.com. ↑ Zvi Bodie, Alex Kane, Alan J. Marcus, Investments, 9th Ed., ISBN 978-0078034695. ↑ "Rule 144: Selling Restricted and Control Securities". US Securities and Exchange Commission. Retrieved 18 May 2013. ↑ "Black Scholes Calculator". Tradingtoday.com. Retrieved 2010-02-12. ↑ Irwin, Douglas A. (December 1991). "Mercantilism as Strategic Trade Policy: The Anglo-Dutch Rivalry for the East India Trade". The Journal of Political Economy. The University of Chicago Press. 99 (6): 1296–1314. doi:10.1086/261801. JSTOR 2937731. at 1299. ↑ Stringham, Edward (2003). "The Extralegal Development of Securities Trading in Seventeenth Century Amsterdam". The Quarterly Review of Economics and Finance. Retrieved 13 September 2011. ↑ The oldest share in the world, issued by the Dutch East India Company (Vereenigde Oost-Indische Compagnie or VOC), 1606. ↑ Stringham, Edward (2002). "The Origin of the London Stock Exchange as a Self Policing Club". Journal of Private Enterprise. Retrieved 16 August 2010. ↑ "Jones v. H.F. Ahmanson & Co. (1969) 1 C3d 93". Online.ceb.com. Retrieved 2010-02-12. ↑ Jackson, Thomas (2001). The Logic and Limits of Bankruptcy Law. Oxford Oxfordshire: Oxford University Press. p. 32. ISBN 1-58798-114-9. ↑ "Stock Trading". ShareWorld. Retrieved 24 February 2012. ↑ "Stock Trading". US Securities and Exchange Commission. Retrieved 18 May 2013. ↑ Mithas, Sunil (January 2006). "Increased Customer Satisfaction Increases Stock Price". Research@Smith. University of Maryland. Retrieved 25 February 2012. ↑ "Understanding Stock Prices: Bid, Ask, Spread". Youngmoney.com. Retrieved 2010-02-12.